Schneider does not require you to wear a company shirt and they do not provide them for free. I bought shirts and I always wear one when I am at a customer's facility. I like looking professional in the eyes of the customer. I'm stuck at home. Just like 2 weeks ago when we had the snow. I'm supposed to go back to work today but I have pushed it back a day due to the ice conditions. I'm anxious to get back out there. I went to Katlaw this past October. I had pretty much already made my mind up to go to America's Driving Force until one Saturday when I visited both facilities. I won't comment on ADF because I did not go there so it wouldn't be fair or accurate if I did. I can tell you that I was satisfied with Katlaw. 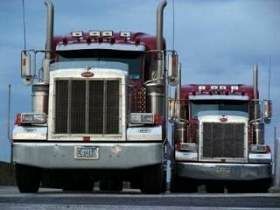 Katlaw will tell you from day one their job is to get you your CDL and to get you a job. In my opinion you are far from ready to be a solo driver just because you managed to get a CDL. You will still need a company's orientation. The first week is classroom. On Friday morning you test for your permit. If you pay attention in class you will pass with no problem. Everything on the permit test is covered in the class. The second and third weeks are in the practice yard and on the road. Barring mechanical problems you will be in the same truck from day one until you test. You will have access to several instructors that have years of experience. And you will get plenty of time behind the wheel to learn. During the three weeks of class several recruiters from large and small trucking companies will come in and give you their pitch. I don't know of any company that hires recent school grads that will not consider students from Katlaw. Also Katlaw's website lists when recruiters will be there and you are welcome to come back and sit in with a recruiter even after you are finished as a student there. Honestly unless you have a bad driving record or recent criminal record you will not have a problem getting a job. If you have any specific questions just ask and I will try to answer them for you. I want to thank Thinks Too Much for all of the time he has taken behind the scenes helping me as I transitioned from "in school" to "rookie solo driver" with Schneider. He always was quick to respond to my emails. Radar is showing practically nothing. I wonder if this is an over reaction to the last winter precip. Temps aren't even forecast to go very low. I have a 16:00 live load today and it has to be in Chattanooga 24 hours later. No way I can make that. I will have to drive at night which I don't like to do. Fortunately it's all interstate. That's trucking. Yeah Texas is big, very very big lol. If you stay out 3-4 weeks they can probably send you west. If you and your DBL have a good relationship, you can ask for loads to certain areas. I got loads to places just by asking, if they had a load going there, they gave it to me. I'm at home, in the frozen Mid-Atlantic lol (Pennsylvania). I was in Long Island today at a receiver, and they apparently didn't believe in putting ice melt in their yard... so I got stuck for 2 hours trying to pull an empty trailer out of their yard while they spread ice melt under my tractor. You have to wear your pickle suit yet? Not yet. I got my hazmat endorsement when I was on home time but I haven't told them yet. I'm getting good runs without it so I figured I would wait until that changes to mention it. I hear we get called in at the 2 month mark to check up on our work and driving habits so I'm sure it will come up then. 61 mph!? You must be mashing the accelerator pretty hard in that big orange truck Richard! Glad to hear everything is working out for you. I loved driving through west Texas, beautiful open roads. I'm in Houston now. Heading to Chattanooga tomorrow. I saw a sign that said El Paso 878 miles. It makes you realize how big this state is. I would love to go to west Texas or any of the western US. I really haven't seen much of the west and seeing the country is part of why I got into trucking. I am happy to be staying out of the frozen north for now. I'm in Texas now where the speed limit is 75. If there were and hills here I would have to put my flashers on. I'm stuck at 61 mph. Unless I'm loaded and going downhill. Then I could do 100 if I didn't use the engine brake. I am a brand new driver with Schneider tanker. I don't have anything to compare to but so far I like everything. The tanker training is intense. From what I hear more so than the van division. It seems more rewarding and in some ways easier than van. I can tell you that after being with my TE for a few days it takes a special relationship to team. You are living in close quarters with someone 24 hours a day. And I have driven 79,500# over some interstates that were so rough that things were falling off the shelves in the back. I can't imagine trying to sleep during that. Good luck with whatever decision you make. I'm surprised to hear this. I thought you would be at big orange for a while. I'm sitting in Keasbey now waiting for a preloaded trailer to arrive for my first solo run. My truck number is 27391. I appreciate all the advice you gave me. I hope to see you on the road someday. Hey Chris. I'm really sorry to hear that. I enjoyed meeting you in Cory and was hoping our paths would cross again. Good luck with whatever you decide to do. They were on my list of companies when I first started looking into trucking because they are local to me but they only hire experienced drivers. I drove to their facility and it is pretty small but all of the trucks I saw there were pretty new and looked like they were in good condition. I see their trucks all over my area. Passed my final. I am a Schneider driver now. I passed my SQT today (Schneider National's final exam) and now I am officially a driver. Tomorrow morning, after 3+ weeks I get to go home. I am exhausted and excited at the same time. I'm ready to go home but also ready to get out on the road and start hauling freight and making money. It is going to take some time to get a truck. I was told to call in Thursday morning to check in but also be ready to leave then if my truck is ready. I hope to meet you guys on the road. That's good info PJ. I have heard that a lot of this will be "learn as you go" at the school of hard knocks. My instructor has told me repeatedly that I only need to remember three things: don't hit anything, don't spill anything, and don't be late. It sounds like things are going good for you. Good luck Danny. I know you will do well. Congratulations PJ. I'm glad to hear you are on your own. It's a long journey to get to this point. I hope our paths cross one day. It has been a fun and fast paced 2 days. My first delivery was to deliver a load of aircraft de-icing fluid to NYC. Are you kidding? NYC on my very first run. Not so bad if you have a navigator riding shotgun. I have seen people do incredibly stupid things to pass a big rig. Afterwards we dropped our trailer at our OC in Keasbey, NJ and spent the night there. Day two was a lot calmer. We picked up a loaded trailer at the OC and dropped it at a tank wash in Cincinnati. Someone else will pick it up and deliver it at a later date. I drove almost all of my 11 hours then my trainer took over to get us to a truck stop just north of Louisville. We have a pickup appointment for 08:00 Monday so we are spending the day at the truck stop. Movie day. My first day off in over two weeks. A day off will be nice but I am ready to see home. My trainer has been driving for 8 years and we get along great. He has been giving me tips on how to get the most out of trucking. He runs hard when he is working. He uses all of his available hours and only stops when required by law, for fuel and to eat. He told me from the beginning to eat fast. Well the classroom and local part of my orientation has ended. I was a fun and fast paced 2 weeks. The training at Schneider is very professional. I can't believe how far I have come since orientation began. My confidence is also a lot higher than it was before. Being from GA I had very little experience with any driving in the snow. Now I have driven a big rig in the snow. I'm still pretty scared about that. Schneider has a support system in place where I can get help with anything I need. I have been told that driving around Coraopolis will give you experiences that can't be matched at the other facilities. The roads are old, narrow, hilly and there is a lot of sign pollution. I have an appointment to meet my training engineer tomorrow at 03:00 to start the OTR phase.